Pull yourself away from the many beautiful beaches of Cancún and Playa del Carmen - not to mention the latter's bustling Fifth Avenue pedestrian zone - and you'll be rewarded with some of the best sightseeing and day trip experiences in Mexico. Among the many wonderful tourist attractions and places to visit within an easy commute by car or bus from the Mayan Riviera are a number of fine Mayan ruins, including Chichén Itzá, one of the largest such sites in Mexico. Also worth visiting are the Yucatán's many fascinating cenotes - ancient sinkholes filled with water - which can now be enjoyed for swimming and snorkeling. Best of all, most of these superb day trips are frequented by the area's tour companies and can easily be booked in advance of your arrival. Plan your sightseeing itinerary with our list of the top-rated day trips from Cancún, Playa del Carmen, and the Mayan Riviera. Three hours west of the Mayan Riviera, Chichén Itzá is one of Mexico's largest and best-restored archaeological points of interest. Highlights of a visit to this UNESCO World Heritage Site include numerous fine examples of the region's famous Chacmools, reclining figures holding sacrificial vessels, which were created to guard the site's many temples. The most important buildings here are the 30-meter-tall El Castillo, also known as the Pyramid of Kukulkán, and the magnificent Temple of the Warriors with its many columned halls. Also of interest is the Tzompantli - The Wall of Skulls - a large square platform that served as a base for the stakes on which the decapitated heads of human sacrifices were impaled. A great way to enjoy this unique location is as part of the Early Access to Chichen Itza with a Private Archeologist tour. Early access to the site allows you to avoid both the crowds and the heat, and an experienced archaeologist will take you to areas not usually available to the general public. This top-rated tour from Cancun can also be booked with departures from Playa del Carmen. Another of the Yucatán Peninsula's most important Mayan sites is Tulum. Perched overlooking the ocean and a pristine white-sand beach, Tulum is the only major fortified Mayan coastal town, and is unique in that it is one of the few such sites to have been built with defensive walls surrounding it. Extending some 380 meters north to south and 165 meters east to west, these ancient fortifications were built to a height of up to five meters in places, with many of the original entry points still intact. Another important structure is the Temple of the Frescos, notable for its stucco reliefs depicting seated figures with elaborate headdresses, as well as large bas-relief masks that were once painted over. The largest building is the Castillo, perched on the cliff-edge overlooking the sea and of interest for its broad steps leading to a terrace on which the two-roomed temple stands, along with a stone used for human sacrifices. Tulum is also well served by formal tours, such as the convenient 3-in-1 Discovery Combo Tour including the Tulum Ruins, Reef Snorkeling plus Cenote and Caves. Along with departures available from both Cancún and Playa del Carmen, you'll also benefit from a provided lunch and admissions. A highlight of any visit to the Yucatán Peninsula is plunging into one of the state's famous cenotes, a form of natural swimming hole unique to the region's porous limestone bedrock. Most often consisting of fresh water, these water holes were much revered by the Mayans as a source of drinking water in times of drought. They also held religious significance, including as burial sites or for human sacrifices. These days, these pristine pools - whether cave cenotes or the open-air variety - are largely free to explore and, thanks to their high mineral content and purity, make for a thrilling swimming and snorkeling experience (some are even deep enough for diving). A couple of the best within driving distance of Cancún and Playa del Carmen include Aktun Chen, part of a larger attraction that includes ziplining and other activities, and Ik Kil, a well-known cenote outside Pisté and part of the Ik Kil Archeological Park near Chichén Itzá. And if you prefer to let someone else do the driving (not to mention taking care of the details), you can explore these cenotes and caves as part of a 3-in-1 combo tour departing both Playa del Carmen and Cancún. This tour also visits the Mayan ruins at Tulum. One of Mexico's largest islands - it's 45 kilometers long and 18 kilometers wide - Cozumel makes for a great day trip for those staying at a resort on the mainland. Traveling to this beautiful island located about 20 kilometers off the northeast coast of the Yucatán peninsula is half the fun, whether you choose to take the regular hydrofoil services from Playa del Carmen (which lies directly opposite the island) or Cancún, or a more leisurely tour boat. In addition to its many superb beaches, Cozumel has much to offer day trippers the moment they arrive in the capital of San Miguel. Just a short walk from the ferry terminal is the Museo de la Isla with its exhibits dealing with the island's geography and history, as well as a number of great shopping options offering everything from local crafts to luxury goods. For those willing to venture a little farther afield, Chankanaab National Park (Little Sea) is a natural freshwater lake and adventure park offering activities such as ziplining, treetop climbing, and swimming with dolphin experiences. For those looking for a little Mayan culture, Cozumel boasts some 30 sites, the best being San Gervasio with its large temple built in AD 800. Just a short distance south of Playa del Carmen is Xel-Ha Park (Parque Xel-Há), a fun aquatic center named after the adjacent Xel-Ha Mayan site. More an ecotourism adventure than a theme park, the central feature of this award-winning attraction is a natural inlet and lagoon serving as a huge aquarium that is home to countless species of tropical fish (part of the park is also set aside as a reserve for endangered sea turtles). A highlight of a visit is the chance to swim and snorkel in its pristine waters as you marvel at the fish and underwater caves. For convenience, an all-inclusive Xel-Ha day trip from Cancun is available (admissions and lunch provided). This tour also departs from Playa del Carmen. If you're going it alone and time allows, be sure to also visit the Mayan ruins of Tancah, just 10 kilometers south of Xel-Ha, the site of a cenote and numerous temples. Another of the Yucatán's large Mayan sites, Cobá's ruins lie deep in dense bush country halfway between the Mayan Riviera and the state capital, Mérida. Built between AD 600 and 900, this 70-square-kilometer site was still occupied when the Spanish arrived in the 16th century (it was abandoned shortly after). Highlights include a number of excavated pyramids and temples among the 6,000 buildings and other structures known to occupy the site, as well as the numerous "sacbeob" (causeways surfaced with limestone mortar and flattened by heavy rolling to form roads), which link the center with the outlying districts. Those interested in visiting the site should consider the Coba Ruins Early Access Tour with an Archaeologist and Cenote Swim from Cancun. 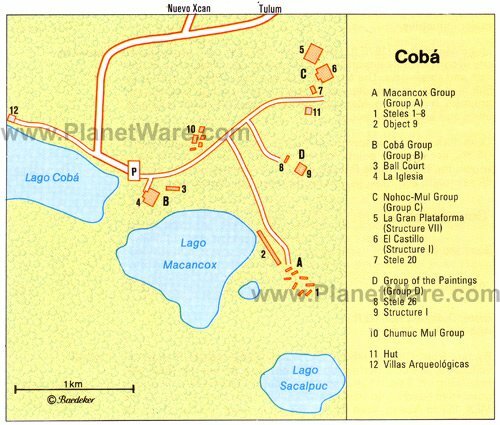 This full-day tour allows you to take advantage of a unique opportunity to visit Cobá prior to its opening to the general public, and under the guidance of a professional archaeologist. This tour also departs from Playa del Carmen and include a swim in one of the area's water-filled caverns, as well as lunch. Unlike many similar Mayan structures, Cobá's Ancient Pyramid can still be climbed, so wear appropriate footwear! Just 15 minutes drive west of Chichén Itzá, Balankanché is an easy day trip that's well worth doing. Known as the Throne of the Jaguar Priest, the ruins consist of a fascinating burial site in a limestone cave that was only discovered in 1959. Part of an extensive labyrinth of underground caverns and waterways still to be investigated, the section currently open is lit up to display the numerous clay dishes, jars, and other objects lying exactly where priests left them centuries ago. Many items are decorated with the mask of the Toltec-Aztec Rain god Tláloc, suggesting that the cave was an exclusively Toltec burial place. The focal point of the cave is a chamber containing an altar and a formation of stalactites reminiscent of the sacred Mayan ceiba tree. A narrow passageway leads to an even deeper chamber, at the end of which, crystal-clear water surrounds another altar also dedicated to the Rain god Tláloc (look out for the tiny shrimps and blind fish that live in the pool). For those seeking a dose of colonial Mexico, Mérida, the state capital, is a delightful addition to a Mexico itinerary. Best appreciated over a two- or three-day excursion, Merida's old-world charm stands in stark contrast to the ultra-modern resort areas of the Mayan Riviera some three hours away. Also known as "ciudad blanca" - the "white city" - due to the locals' preference to dress in traditional white clothing, Mérida was settled by the Spanish in 1542, and thanks to its many fine parks and gardens, remains a wonderful place to explore on foot. Now home to countless expatriates from Europe, the US, and Canada, many of the city's quaint old squares, such as Plaza Mayor (Plaza de la Independencia), are surrounded by art galleries and fine boutique stores, as well as great restaurants and cafés. A number of notable buildings can also be found in the picturesque Parque Cepeda Peraza, including the Church of Jesús with its exquisite altarpiece of carved and gilded wood. Another great way to see the old city center is to take a horse-drawn "calesas" ride. Although far enough from Cancún and Playa del Carmen to warrant an overnight stay, the coastline to the north of Mérida is certainly worth visiting. A particularly charming spot is the small seaside town of Campeche, famous for its old Spanish fort, Fuerte de San Miguel. Set in a picturesque location overlooking the town, this piece of old Europe is accessed over a drawbridge and still has the original cannons installed by the Spanish. Apart from its great views, other highlights include a small but very interesting archaeological museum (Museo de Arqueología) with numerous artifacts from a wide range of Mayan cultures, including a set of terracotta figurines from Jaína. Campeche itself is worth exploring and offers a variety of accommodation options. A little further east of Mérida and Chichén Itzá is the lovely colonial town of Valladolid. Its splendid old architecture and laidback pace make it a fun overnight excursion from Cancún and Playa del Carmen. Although it's the third largest city in Yucatán, it's not big - its population is just 50,000 - making it an easy place to explore on foot. In addition to its many brightly painted colonial homes, you'll be rewarded with a chance to visit the lovely old Convent of San Bernardino (Convent of San Bernardino de Siena), founded by the Franciscans in 1552. Valladolid is also notable for its many cenotes within an easy stroll of the city center, including the Cis-ha and Zac-hi cenotes, accessible via a gangway leading to the water's edge some 45 meters below (bring your swimsuits). Also worth visiting is the 20-meter-deep Cenote Dzitnup, a delightful spot with warm, cobalt blue water just a short drive outside the city. amphibious vehicles (think mini-jeeps) that you can steer through the jungle-like setting along some five kilometers of trails. Other fun things to do here include swimming in a cavern full of stalactites and stalagmites, or simply lounging about and relaxing on the hammocks provided. The park also offers a variety of food and beverage options, too.